Recently named “the most beautiful place in Oklahoma” by House Beautiful Magazine, the 25-acre Philbrook Gardens provide a setting like no other. A little piece of Tuscany in Tulsa. No tour of Philbrook is complete without a walk through the gardens and grounds. The essence of the garden design complements Villa Philbrook, with outdoor spaces for viewing nature. The south garden offers a sensory garden complete with sitting spaces framed in wrought-iron arches that mimic those found in Villa Philbrook. The gardens feature plants native to Oklahoma, a variety of pathways, bridges, a sculpture walk, and a meandering creek. The entire grounds are ADA compliant. The formal gardens that descend to the tempietto were part of the original design and construction, while the gardens extending to the summerhouse at the south of the property were conceived later and completed in 2004. Take the Philbrook Gardens home with you. Purple Teddy Mix Tulips, Aida Hyacinths, Misty Glen Daffodils, Persian Lilies, and more are available for sale through the Philbrook Shop. (918) 748-5304 or museumshop@philbrook.org to order. Members receive a 10% discount. Visitors wishing to conduct posed photography sessions (portrait, prom, group, proposal, etc.) in the Gardens during regular museum hours may do so with the purchase of an Open-Hours Photography Permit. Permits are available to groups of up to 10 people (includes photographers) for $50/hour. If the 1-hour timeframe is exceeded, guests may incur additional fees at check-out. Permits are intended for non-professional photographers. For more information about professional photography options, please contact Philbrook’s Guest Experience Coordinator at (918) 748-5347. A single tripod or monopod and a single reflecting screen are permitted in addition to a camera and camera bag. Additional equipment and changes of clothing are not permitted. Permits are non-exclusive and contingent on availability. Philbrook reserves the right to limit the number of photographers and limit access to certain areas of the Gardens and grounds at any time during a session. Groups of 10+ should call in advance to schedule and may be asked to schedule an After-Hours Photography Session. For more information about large group photography and for After-Hours Photography Session pricing, please contact Philbrook’s Guest Experience Coordinator at (918) 748-5347. There are endless ways to experience the 25 beautiful acres of the Philbrook Gardens. Here are some of our favorites. Make your own. Bust out the brushes. Paint in the Garden. Be an insect explorer. Catalog your findings. Read a book in the shade. Explore the areas around Crow Creek. See what’s new. Play card games by the rock fireplace. Find all four bridges. Play Have a leaf race. Drop a leaf into the creek on one side of the bridge and go to the other side. See whose leaf comes out first. Stand in an open space. Run around Sound of Music-style. Singing optional. Be a statue. Take a pic. Share with #philbrook. Bring a mat. Do yoga. Find a four-leafed clover. We’ve done it. They’re out there. Watch a film on the lawn. Look for fireflies at dusk. See what’s growing in the Secret Garden. Find the flower inlaid into the stonework path. Look closely. Picnic in the garden. Bring your own or pick up something at Kitchen 27. For many guests, the most popular attraction in the Philbrook Gardens are our three cats, Acer, Perilla, and Cleome. While they do provide some level of pest control, their main job is to bring smiles to the faces of visitors and provide an endless amount of social media gold. Look for them on your next visit. Philbrook Museum of Art is a unique and romantic setting for weddings and celebrations of all sizes. With indoor and outdoor facilities available, the “most beautiful place in Oklahoma” provides numerous opportunities and customizations throughout the journey to your big day. Take advantage of one or more of these opportunities. Create memories that last a lifetime. Photographers who wish to use Philbrook’s Gardens and grounds are required to become Photography Members or pay a one-time user fee. Unless otherwise indicated, general admission visitors may take personal-use snapshots during their visit. Flash photography is not permitted. This garden yields hundreds of pounds of herbs and produce, some of which goes into the dishes of La Villa, the Philbrook restaurant, while the rest is donated to The Community Food Bank of Eastern Oklahoma, and Food on the Move. The garden is anchored by a geodesic dome designed by Los Angeles artist Chris Kallmyer. Philbrook is proud to partner with award-winning artist Karl Unnasch to present SLUMGULLION (The Venerate Outpost), a full-scale log cabin built from the skeleton of a late-1800s pioneer home. This permanent installation will inspire and facilitate programming, creating a gathering space both natural and enchanting. SLUMGULLION provides a highly aesthetic and intriguing space for a new genre of provocative and rewarding experiences. Since the early 1970s, Philbrook Films on the Lawn have been a beloved Tulsa summer tradition. Philbrook now presents films year-round, the fourth Friday of each month. Outside when it’s nice, inside when it’s not. Always fun. 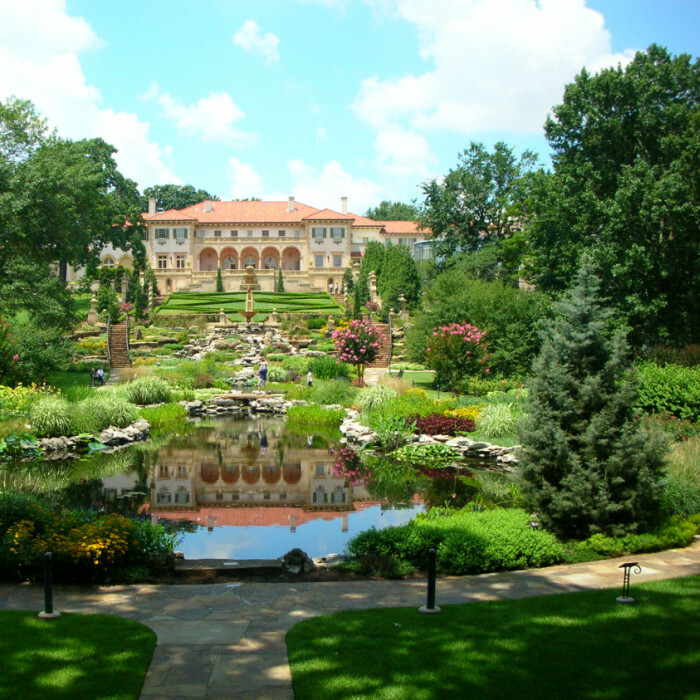 You may picnic in the Philbrook Gardens any time during normal Museum hours. Pick up something in the restaurant. Bring something from home. Make it special. 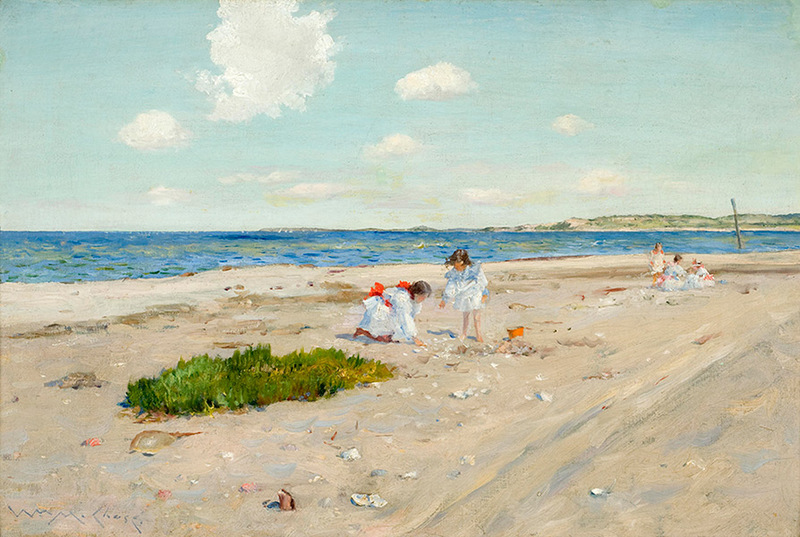 Stroll and see. The Westby Sculpture Walk features a variety of three-dimensional work installed on the museum grounds by artists from around the globe. Make sure to strike a pose and become a sculpture on the selfie platform.